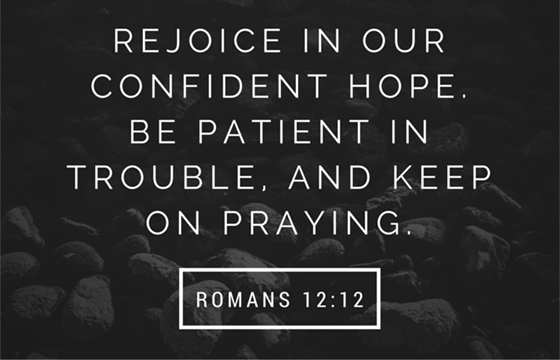 Paul tells the Philippian church that they should pray about everything. Everything, like in all things. Not just the big things, not those things that are important to us, not just the things we want, but everything. As followers of Jesus we have a direct line to the Lord of the universe through prayer, yet praying about everything is something that I struggle to wrap my head around. Worse yet, it’s something I struggle to do. One of the first things I do every time I fly is pray for a safe journey, but if I have a headache I try to solve the problem myself with over the counter medication. That’s because I have believed the lie that God has bigger things to attend to, so I don’t approach him with the little things, I only approach Him with the big stuff. I find that I parent that way too. I find myself relying on friends, family, therapists, medical professionals, medications, and natural remedies on a daily basis. The one thing I don’t get right every day is praying for my kids. I often excuse my spotty prayer life by telling myself that He knows just what I need. Yes, Jesus knows what we need, but he still wants us to ask Him for it. The story of the two blind men in Matthew 20 is an example of that. He wants to hear from us. He made us to live in relationship with Him. He doesn’t only care about our big things. He cares about everything because He knows the number of hairs on our heads. Paul says that we are to keep on praying. We need to pray for healing in our kids lives, that they will learn to trust us, and that we would parent them with connection in mind. We need to pray for their hopes and fears. We need to thank the Lord for His faithfulness. And if we don’t get the answer we need today, then we have to pray for those things again tomorrow. The Lord’s timing is perfect and it is rarely the same as ours so keep on praying. Lord, thank you for caring about me and all that matters to me. Thank you for hearing me when I call. Forgive me when I don’t come to you with my stuff. I know that there is power in prayer because I know that you love me.